A Sacramento family is up in arms after discovering that a local special needs school is letting students play M-rated videogames as a reward and to help them "socialize." Robert Moore is a 16-year-old student at the East Valley Education Center who suffers from "mental and emotional problems." In September, his parents learned that he and other students at the school were being allowed to play Call of Duty 4: Modern Warfare in class, a problematic situation because, his parents claim, Moore's "anger issues" were worse when he came home after playing the game, even leading him to become violent toward his younger sister. But when Moore's parents contacted the school, they were told that the games were used as a reward and to help the students socialize by drawing them out of their shells. The principal also told them that the games would continue because no other parents had complained, although once the local CBS affiliate got involved, Assistant Superintendent Jose Adalco said over the telephone that the games would no longer be allowed. 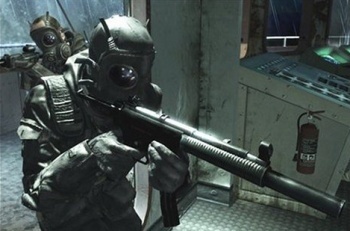 The original report trashes things up about as you'd expect, confusing Call of Duty 4 and Modern Warfare as separate games while using gameplay footage of Black Ops to make its point. There's no indication of whether or not other games are on offer at the school, and a missed meeting between the reporter and the assistant superintendent is made to sound as though Adalco is on the run from the truth. But trashy reporting notwithstanding, it's a fair question: why is this school letting kids under 17, and especially special needs kids, play M-rated games? 16 may be close enough to 17 for some people, but isn't that a decision parents should be making?